Worldwide, people are less physically active: in the WHO European Region, one third of adults and two thirds of adolescents are insufficiently active. In consequence, physical inactivity has become a leading risk factor for ill health. 1 million deaths and 8.3 million disability-adjusted life years lost per year in the Region are attributable to physical inactivity. As physical activity decreases, noncommunicable diseases (NCDs) are increasing. Diabetes is one of four major NCDs and, with cardiovascular disease, cancer and respiratory diseases, diabetes accounts for most of the disease burden and premature mortality in the European Region. Diabetes is diagnosed in 60 million people in the Region, and it is estimated that 50% of cases of diabetes have not yet been diagnosed. The prevalence is increasing all over the world, and WHO projects that diabetes will be the 7th leading cause of death by 2030. Risk factors for diabetes include overweight or obesity, an unhealthy diet and physical inactivity, which account for about 80% of the increase in prevalence of diabetes. These risk factors can be modified. Physical inactivity alone is estimated to cause 7% of the burden of type 2 diabetes in the European Region, and overweight and obesity account for an estimated 65–80% of new cases of diabetes. Children need at least one hour of moderate-to-vigorous physical activity every day. However, today, only 34% of European adolescents aged 13-15 years are active enough to meet the current guidelines. Generally, physical activity declines significantly among young people aged 11-15, and this trend is particularly strong among young girls. The predominant causes of physical inactivity are environmental and systemic. It is becoming more difficult to maintain sufficient levels of physical activity, as people's daily work and living environments are increasingly sedentary. Furthermore, there are important inequalities in levels of physical activity: poorer people tend to have less free time and limited access to leisure facilities or live in environments that do not support physical activity. Minority ethnic groups and people with disabilities engage in less physical activity and are also harder to reach for promoting physical activity. Addressing the risk factors for type 2 diabetes and halting its increasing prevalence call for whole-of-government and whole-of-society approaches. WHO/Europe's newly endorsed Physical Activity Strategy for the European Region 2016-2025 is an important step towards reducing the burden of type 2 diabetes. The strategy aims to inspire governments to facilitate and remove barriers to physical activity in the environment throughout the life-course. encouraging evaluation of actions aimed at increasing physical activity, to contribute to the development of an evidence base on actions that are effective and cost-effective. 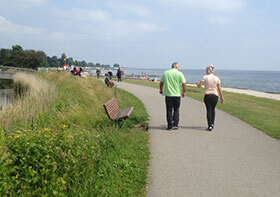 Physical activity is also a part of the action plan of the European Strategy for the Prevention and Control of NCDs. The WHO Global Strategy on diet, physical activity and health complements its work on type 2 diabetes with a focus on population-wide approaches to promote healthy diets and regular physical activity. Type 2 diabetes was until recently seen as a disease of middle-aged and elderly people, but it is now increasingly seen in adolescence and childhood. Up to 27% of 13-year-olds and 33% of 11-year-olds in Europe are overweight or obese. Childhood obesity is strongly associated with an increased risk of NCDs, including type 2 diabetes, and people who are overweight in childhood are likely to be so as adults as well. Childhood overweight and obesity are therefore key factors in the increased prevalence of type 2 diabetes. Every year, World Diabetes Day on 14 November raises awareness about the disease. Diabetes is also the focus of activities for World Health Day 2016, on 7 April.